My hands cover Miss M’s tiny ones, which are holding onto her dad’s sides. She doesn’t have the arm span to reach around him. My legs and arms hold her in position, between us on our rented motorbike. Her helmeted head is turned sideways, watching the trees rush past as the motorbike strains along the winding road up the mountain called Doi Suthep. She is, for once, still. Every so often I will hear her make a motorbike noise, a long “ahhhhhhh” that matches the noise of the engine, which her dad echoes. The air is slightly cooler as we climb. My backpack is full of extra clothes because I’ve read the temperature at the top of the mountain is eight or nine degrees lower than in Chiang Mai. And Darling Man feels the cold. 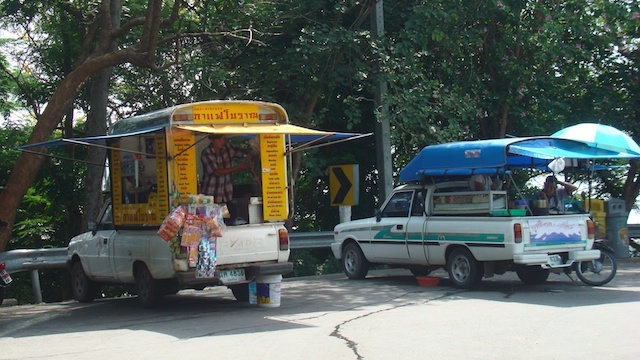 We round a bend to find a couple of food stalls, cleverly set up on the back of trucks. We have no timetable, no real plan for the day, so we stop to eat. Meat on sticks and spicy papaya salad. Below the road, butterflies, a running stream and signs pointing to a waterfall. We decide to leave the waterfalls for another day. As I put Miss M’s helmet back on, Darling Man pops the motorbike seat up, takes the petrol cap off and peers into the fuel tank. “Have we got enough petrol to get to the top?” I ask. “Yeah,” Darling Man says in his usual breezy manner. He is the ultimate optimist but not so good at forward-planning. I bite my tongue and arrange the baby into her motorbike-riding position. We drive off, up and up. I see wild orchids growing along the side of the road and smell the fragrance of enormous flowering trees overhead. Every so often we seem to lose power. I don’t feel so relaxed anymore. Finally, a sign tells us we are three kilometres from Doi Suthep, the name of the mountain and the sacred wat perched on its peak. I think we’re going to make it. Then a steep hairpin bend surprises Darling Man and he brakes. When he accelerates again, the bike strains and strains but can’t seem to get going. “We are too heavy,” Darling Man says. I think it’s too dangerous to wobble along such a steep incline, so I grab the baby and jump off. Darling Man says OK, revvs the engine and drives off. I have the baby in one arm, a full backpack on my back and a heavy helmet in my other hand. And a very steep slope ahead of me. Definitely not relaxed now. I start climbing. Can the air be so much thinner up here? Is that why I can’t catch my breath? The arm carrying the baby aches but I can’t switch arms because the helmet is so awkward. The clip won’t hold — it would be useless in an emergency — so I can’t sling it over my arm. Other motorbikes zoom past me, their riders and passengers talking and laughing. The baby is HEAVY. And my legs ache. That morning I went to the gym for the first time in years. Darling Man reaches a flatter bit of road and turns around to see me struggling up the mountain. He parks the bike and runs down to take the helmet. Then, after a moment’s thought, takes the baby too. I’m now in a pretty crabby mood. I’m hot, I’m tired and I ache. I grouch a bit, then feel awful about it. We all get back onto the motorbike and ask it to *please* take us the next little way to the top of the mountain. It does. Darling Man lets us off near some food stalls and drives off to find the parking area. Miss M begins exploring. 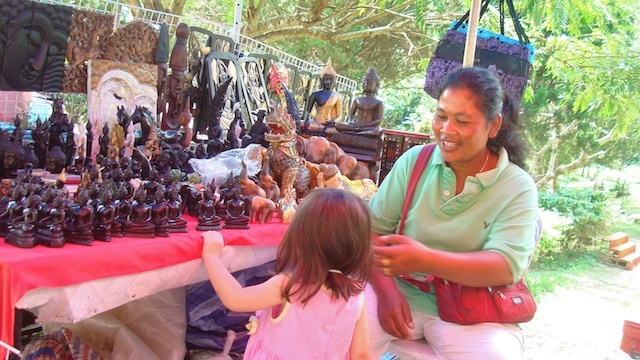 I buy a sausage on a stick and follow her around, pushing food into her mouth as she investigates the bells, birds in cages and Buddha statues on display at the stalls. Darling Man joins us. He’s bought a sausage on a stick too, and some passionfruit juice. Miss M is having a ball. She is investigating things and charming the stall holders. She doesn’t know we’ve come to visit a pagoda. She is just in the moment, loving what’s right in front of her. Even as I think I should try to be more like her, I’m impatient for her to eat something so we can get to the temple. 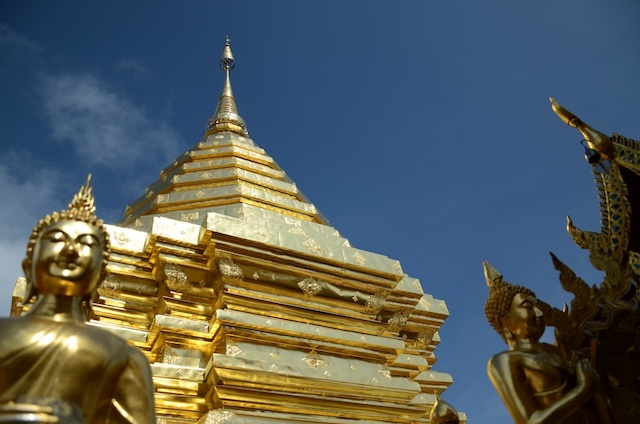 At night, we can see the golden domes of Doi Suthep high about our place, lit up so it appears to float in the sky. Finally, we deem Miss M has eaten enough. We cross the road and start up an enormous flight of stairs. Miss M wants to be carried. But daddy is not good enough today. She wants to be carried by me. By my aching arms. I put my head down and start powering up the mountain, certain I will be markedly thinner when I get to the top. Then I spot the child. Then I see more of them. They are adorable. I snap a few photos before their handlers spot us. The children are shouted at, then they start looking at us and saying “money”. Ah, that old trick. Miss M is entranced. The girls are wearing hats with dangly beaded bits. The girls are equally entranced with the baby. Their handlers keep yelling at them until they all have a coin in their hands, then they are allowed to be kids again, and play with the baby. 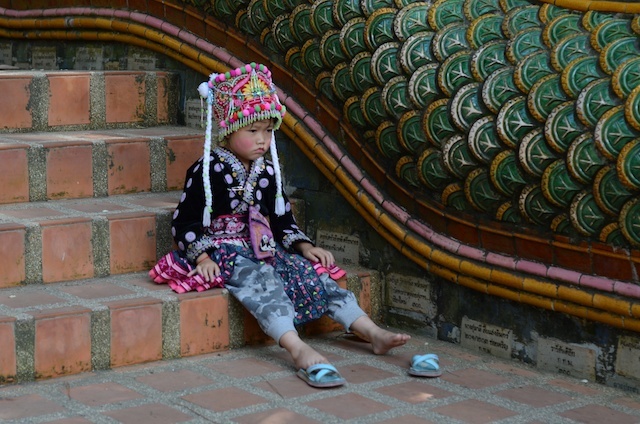 Our journey to the top of Doi Suthep has taken hours, and we’re still not there. While Miss M plays with the children on the steps, tourists on their way down stop to take pictures. Ladies pick up Miss M and try to pose with her, but she just wants to play with the kids. Finally, she cracks it with the tourists, and I pick her up and carry her to the top, where another world of delight awaits. There’s musicians and dancers performing at the top of the stairs. Miss M hurtles towards them and immediately starts participating. The crowd makes an audible “awww” when they see her trying to dance. Then she moves over to the band, where a gong and a tambourine catch her attention. The dancers and the musicians are so sweet with her. The other tourists don’t seem to mind Miss M “spoiling” their photos or the performance. After a while, Miss M finds some off-duty dancers and plays with them. Another hour or so has passed, and we still haven’t reached the golden domes. 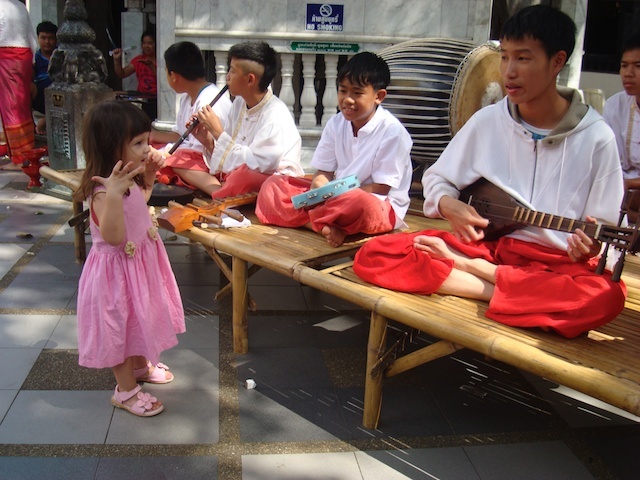 There are so many children performing at the temple, yet it’s Friday. I wonder if they go to school. Some of the boys in the band are very young, maybe only 10. Miss M is starting to act a bit tired. I decide to tear her away from the performers so I can see the golden domes before her nap time. Shoes off and up more stairs. Oh, my legs! Then finally… the gold stuff – the chedi, statues, shrines, gardens, stalls, courtyards, corridors. The place is amazing. But we are all tired now, and it’s hot. And my bag of warm clothes is heavy. 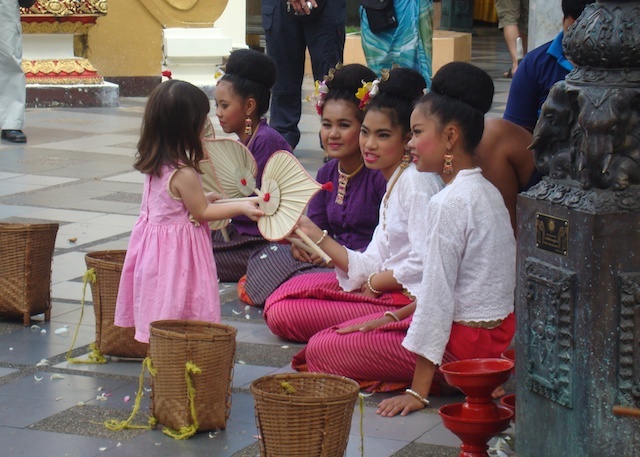 Miss M follows some devotees who are walking around the chedi with flowers and laminated prayer sheets. She stops for some milk. She lies down on the marble and drinks, eyelids drooping, legs waving around in the air. It’s time to go. We begin the lengthy process of leaving the temple, past all the exciting people and places and things that drew Miss M’s attention on the way up. She’s drawn to them all again. Our departure is just as slow as our arrival. Except the steps are a bit easier on my aching legs. On the bike again, Miss M’s tiny hands at her dad’s sides, my hands on top of hers, my legs holding her safe. We round two turns and the engine cuts out. We have finally run out of fuel… but we have no choice but to continue. Darling Man brakes when we starting building up too much speed. 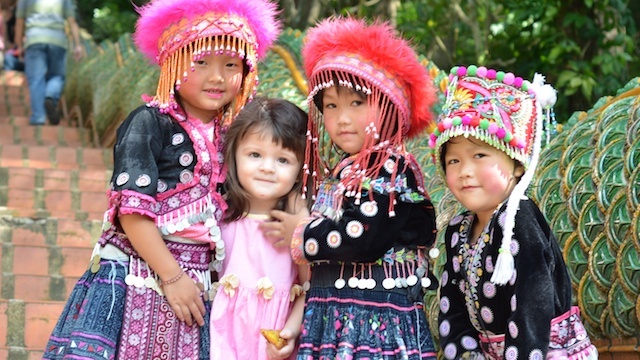 We stop at a scenic lookout, where a truckload of students crowd us, taking photos of Miss M and pinching her cheeks. Back on the bike, freewheeling downhill again. We get passed by a man on a bicycle. We pass several cyclists grinding their way up, red faces looking pained. Miss M falls asleep. I worry that she’ll strangle herself with the helmet strap. I put her into a safe position that’s very uncomfortable for me. Down, down, down. Cool wind rushing by. Darling Man keeping us safe with the brake. Eventually, there’s no more mountain. We coast for quite a while, slowing and slower, coming to a gentle stop right outside a cafe. I carry Miss M inside and place her on a couch. Darling Man starts pushing the bike to a petrol station. When he returns to the cafe he tells me someone stopped to give him a push. The sky darkens and I decide we have to head home before it rains. I scoop up Miss M and she wakes up, immediately interested in her new surroundings. Darling Man and I groan. We are tired from our outing and would like a rest. As you can imagine, the rest of our day is not so wonderful. It must be great to spend such quality time with Miss M. The memories for both of you will last forever. Spencer recently posted..Today’s Super Hot Hotel Deals for the Dominican Republic!